Yall…It’s one of those days. I have already run 100 errands this morning and now I am back home and ready to crash. But, oh. Yeah. I can’t. Why? Because my life is insanity all the time! Yes, I am technically considered a stay at home mom, but let me tell you why that isn’t always the easiest. I have dishes and laundry nonstop-and my dear gosh-pray for me when this baby gets here. I have a strong feeling it isn’t going to get easier. Doctor appointments are an every week thing….and here is why. One kid in school means sickness NONSTOP. Literally, I have to pick him up early for an appt today. Then he likes to pass on his sicknesses to the other kid a week later. Let’s just say our docs know us well…. And of course, all the blog things going on now…Which I refuse to complain about! You all have been amazing at keeping me busy, and I love it! But I want you to know, this blog venture isn’t always easy. Maybe one of these days, I will try to give you the rundown of what each blog post entails! I also work in the office one day a week for a Non-Profit Foundation. Let me tell you, I LOVE my job! I get to find people to donate money to and that is pretty darn fun. But with that, comes board meetings that I have to prepare for, meet with potential NPO’s to work with, emails, phone calls, work conferences, etc. That all can’t be done during one day, so my work week is whenever I have a moment to take care of those things….a lot of times….in the carline to pick up my son, driving to appointments, just whenever! Now throw in all the day to day things that happen, and really, life can get messy if I don’t somehow stay organized! I want to share with you all how I do it! But I like a backup….so….. This is my newest addition to the calendar family..and it’s so fun! I am doing my best to start meal planning a bit better, and this has a place for my meals, things to do weekly, monthly, and daily. I even have a “goals” section! It’s metal, so I can use my dry erase markers and this way we can edit as we go! Check out our month here…. How cute that our name is at the top?? And for everyone who doesn’t know, believe it or not, it’s pronounced “Cook”! Make sure Click here to buy one of these awesome customized family calendars, or any of the awesome things Picture it Custom has to offer… I am telling you…they are amazing! Every item they make is gorgeous! My favorites are the Metal prints and Wood pallet prints. Their prices are amazing and the quality is phenomenal! Check out their showroom here..
And all you picture fanatics like me: Sometimes you need to print those pictures off and use them as a statement piece in your house. Now is the time to do it! And what an amazing present for a bride to be, anniversary gift, or a special keepsake for a momma to be. Just thinking out loud here people. Ok now that my local business rant is over, make sure to look them up on IG, follow, support, and come back to tell me you did….I want to know! It’s not joke. We all compare. We all analyze. We all judge. And while we all try not to, (at least I would think) it’s difficult! And not just thinking we are the ones doing it right–It’s more like thinking we are constantly in the wrong. Like-seeing the mom at Chick Fil A not lose her cool over her kid doing that, when I totally would have. It’s pushing our child too hard in school, or not hard enough….It’s not feeding them the right foods, making them drink enough water, play outside enough, read them enough stories, etc. It’s all there. Tell me I am not the only one with these thoughts?? I refuse to believe I am the only one who feels this way, and wanted to make it clear. Today, momma, you are enough. You are perfection. You did it. You kept them alive. They were fed (maybe not bathed) but hey, nourished at least. And I am not just talking about raising our big kids. *gulp* I just referred to my chit-lins as “big kids.” But really, I mean the Little’s too. The infants. Can we talk about the whole “breastfed vs. bottle-fed” conflict? I once had someone ask me how my oldest was fed..I replied with something like “He is a bottle baby (formula baby)” or something to that affect. It killed me that I couldn’t breastfeed. That is what I wanted for him. And for myself. Her response? “God’s way is never the wrong way.” I died. I didn’t want it all to go that way. It just did. She unknowingly called me out, and it broke me. What I should have responded with? “Ummmm. Fed is best. Nourished is best.” But after the shock wore off, I just cried. If she would have known my struggle, she never would have made that comment. I thought it was so insensitive….And you know what I felt? Guilt. Like I wasn’t enough for my baby. I’ll talk more about all this come later in pregnancy, but until then…..the guilt continues. Something I think about (or talk about often if you know me in person) is how so many people are unable to have babies and this is all they truly long for in life. Pregnancy. To carry and hold their own baby. Or the others, who pine to adopt a baby with no home, but are unable because of the cost of adoption. And the guilt these ladies feel is overwhelming. Like maybe they aren’t enough… While every day, we see so many women popping out babies left and right who truly don’t deserve the privilege, nor do they cherish their title as mother. It’s cruel and unfair. I hate it. Now while that may be a tad controversial, I truly believe it. So we are left with the mothers who know what some women are struggling with as far as conceiving goes, and our heart aches for them. We know that every baby they see born is a reminder of the fact that they still aren’t a mother. That they aren’t pregnant. That they can’t feel their own baby kick. I am doing my best to be a friend to those and truly sympathize with them. To cry with them. To listen to them. Just to be there. I have to admit, my pregnancies have brought on guilt for this reason. Every time I have found out I’m pregnant, I know there are some who truly want the same feeling and can’t have it. It kills me. Then I want to apologize for my pregnancy. To apologize for happiness. This is where the pregnancy guilt kicks in. It’s a rough cycle ya’ll. But if you are one of those women who are trying to conceive, trying to adopt, thinking about the feeling of pregnancy every day, please know I am in your corner. I want you to experience this more than I can express, and only want the best for you and your family! And while sometimes it’s so hard NOT to complain about being pregnant and all the little things that comes with it, I am trying my hardest to cool it. There are so many out there who would kill to be in my misery. I’m trying to be sensitive to that! This is something that has been weighing on me for a while…and today was the day to share with you friends on my corner of the internet. Thanks for following along with me and I hope this doesn’t offend or hurt anyone along the way. You all are amazing and I cherish you all! Make sure to leave me your thoughts here-good or bad! I want to know..Fill me in yall! I was told Dale is going to need a second job–and we may have been told correctly. Girl clothes are just too fun! Don’t get me wrong, I love to dress my boys up, but there is something about baby girl clothes-they are so DANG CUTE! So I wanted to show you all a few things I have gotten so far, and seriously-my stomach hurts from all the cute. So the first thing I wanted to show you is what baby girl will wear on her first day out (of the womb that is). I hate that when babies are born they all wear the same exact hats-boy or girl. I love the way those newbies look in those hats, but I wanted my baby to have something original! In comes Infanteenie Beenie. They have the cutest newbie hats you will ever see-boy or girl! They are ridiculously soft and I love that they still have the feel of the ones you get in the hospital-just with a little more jazz. Cash wanted to dress his baby doll in these so bad ( and not gonna lie I had to see what they looked like on, so we tried them on the baby). Now they both are stashed away til we pack the diaper bag for the hospital! Seriously though, so far, these have been some of my favorite items for Baby Kuch. To follow her on Instagram, click Here. You will die from all the cute! And might I add, this would be an AMAZING gift for any momma-to-be…..You have to add this to your baby shower gift list! Ok next items came from Baby Bear and Co. I am seriously obsessing over this gown….Y’all. THIS. GOWN. IS. EVERYTHING. Not kidding, it combines all the things I love in my clothes-Floral pattern/ruffles/stripes. Could it be any more chic? And it’s a baby gown! I can’t wait to pair this with a huge headband, and then make myself a matching one. Eeeek! I can’t stop looking at it! It’s so fab–and now tell me….Did you all put your babies in gowns? I never used them for my boys..because…well. They are boys. And I felt weird putting them in gowns. But this time, I feel like I may lean towards gowns way more–I am thinking 2am diaper changers will be so much easier sans 100 buttons. What is your take? The next things I got were some super cute canisters ( I can’t think of what else to call them) for her room! 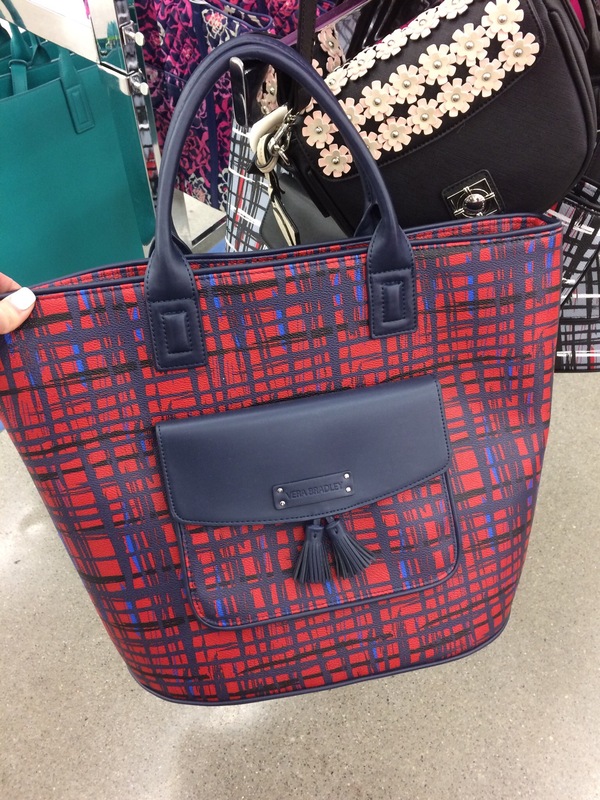 These were in the Target dollar spot-and I totally fell in love! I can see these on a cute floating shelf and serving zero purpose except looking cute. Hehe… Just had to share! And one more just because Peaches was so interested in these…This pup has good taste! I also wanted to give you a sneak peak into her curtains….They are still in the plastic-but I couldn’t’ help myself! Now these items, ooooh man I am loving! My family in Florida sent these up and I am so smitten! Please……Just please. Check out those shoes. Now if someone can find me matching shoes, that would be the dream….Glitter and scallops? What could be better? I also had to throw these in there….Look at those giraffe feet! Gah I am in love with these cute animals on the feet (and on the booty!) It’s preshy! And I am thinking all of these items came from Target, so go shop them now! Any momma would be happy to have these items for baby! This romper (sorry it’s wrinkled) is from Baby Gap,and rompers are my BABY JAM. Ok seriously though, if I could dress her in a romper every day from about 6 months on, I would. They are my favorite! And I have decided, I love babies that dress like adults. Not infants, but babies. So now you know. And I know so many people hate that, but it’s my baby style! Ok now to the romper. This was $1.00 babes! Seriously, at Gap that would have run me probably 25.00+. I can’t wait to get her into this little bubble romper-and for a buck, you can’t beat it! So that is my haul for baby! I can’t wait to show you all what else we get along the way..and are so thankful for everyone’s support already! Thank the lord it’s FRIDAY! OH. Wait. I’m a mom. And have sick kids. Sooooo…. Yea. Not too much to celebrate here. But, I am so grateful we only have Bronchitis+ear infection+sinus infections here. It could be worse…My Mom has Strep throat, and my grandfather has the flu. Granny had bronchitis all last week-this family has been hit hard! Remember that last post where I was so ambitious and was going to do allllll the fun things over Winter Break? You guessed it-those plans fell out the window. Hit hard. And rolled into the high grass next to the road to never be seen again. Let me just say, I have HIGH HOPES for next week..Guess what were doing? Were heading to Cleveland for a Cavs game! My heart just skipped a little thinking about it….We went last year and it was genuinely one of the most fun nights of my life. It was also the coldest night I ever remember! The wind was so cold it BURNED. It felt like my skin was being cut through my jeans–my poor thighs were ICE. I felt like those people trying to hike Everest. You are frozen but it doesn’t matter. You are on a mission and you DEAL. We were some of the only few crazies who were walking around #TheLand before the game to soak in all the Cleveland vibes….and man did we get them. It was Christmas Day so everything was closed of course, except for a couple restaurants but we soaked in every breath of that cold air. Adored every piece of architecture. And cried tears that almost froze from giddy laughter! I am ready for another night like that. Honestly, I think I deserve it. He gets 10 excused absences FOR THE YEAR. We literally have already used 8. That makes me so sick! I hated to miss school as a kid…and vowed my kid wouldn’t miss school unless we were doing something really awesome: like going to a Cavs game. Hehehe. At any rate, the reason behind the post: THIS COLD WEATHER. I can’t remember a time where Knoxville has been so cold for so long! And you will laugh, because we have only been in the teens and twenties, but it feels so cold! Where all of my family is in Ohio, the windchill has put it at -14 DEGREES. Holy cannoli that is rough. Either way, us Knoxvillian’s must all be sissy’s because we can’t handle it. All I have wanted to do is wear the warmest clothes I have and snuggle on the couch with coffee and my favorite blanket. Anybody with me? I know of so many Mom’s who are soaking up the time at home (because leaving the house is TOO MUCH WORK) and to leave might just threaten your cheeks with frostbite. I feel so badly for all of our friends who have to work outside in this mess. And think of all the ones who are stuck in FEET of snow. ( Ok I am actually kind of jealous of those people-I have never seen snow of the sort!) Either way guys, please stay safe this winter. It’s a mess! Next order of business: I want to show some of my favorite people my FAVORITE snuggle blanket of all time. You can’t buy it at a store. You can’t order it online. It’s one of a kind. And I MADE IT. Me! I am so proud of this thing. It was my first big quilt..and dolls, it is BIG. I made it big enough to fit on our bed buuuuttt…..it’s crooked. Like-really crooked. ( I had no idea what I was doing BTW.) And i was devastated at first. On top of it looking all jankety, I saw every. Single. Flaw. It took months to finish and I had no idea what I was doing–and I had to piece it together, triangle by triangle .Then attach batting to the middle. I also had to piece together a quilt of some ugly sort to the back because it was so huge there isn’t fabric at Joann’s big enough to cover it. Again-HUGE. But this blanket y’all , it’s now a piece of me. Maybe even tradition if you will. It may be our newest ‘horse blanket.” I don’t expect you to know that that is, but I will happily explain:) My Mom’s grandmother made a blanket and we inherited it. It was covered in horses of different colors and tattered to pieces. As kids, we all used it and never thought a thing of it-til it was gone. I would kill to have that blanket back now. The sentimental value is irreplaceable even years after it has been gone. I am hoping one of these days, this blanket of mine will be my kid’s “horse blanket.” The blanket that is used nonstop. The one people ask about when they come to visit for the first time. The one that means the most to them as time goes on. Don’t ask my why I have become so attached to this large piece of fabric. It’s just smaller pieces of fabric sewn together. Nothing fancy. Even still, I am not realizing how important blankets are in this house. I made Ford a blanket when he was 6 months old. He immediately loved it and I was thrilled! He quickly became attached, and got to the point that he wanted a specific corner near his face to fall asleep-weird, I know. We couldn’t even tell the difference between the corners, but he could! So as we put him in bed, we would rub each corner on his cheek until he gave us the OK that this was THE corner. When he got to the point where he could talk, he would tell us he wanted his “corner”. Not even his blanket. He had to have the “corner.” Crazy I know-but totally true. Looking at that blanket now, you know exactly which corner it is. Because it been sewn back together countless times. Because it’s tattered. It’s falling apart. But he still sleeps with it every night: religiously. We have only had one instance where we left it at a restaurant in Florida. We noticed it about 20 minutes out and immediately ran back for it. Whew! That was a close one. I can’t imagine how that trip would have gone if we lost that blanket. Not good ya’ll. Not good. Dale’s Momma knit him a blanket with a huge OSU “O” in the middle and he loves it. It the sweetest! It just goes to show how much we love our blankets around here! We each have one here that we love, and I hope it always stays that way forever-that there is something we each cherish. Ok yall-the blanket rant over. Promise. Is there any particular THING you have that you cherish like we do? Any items that have been handed down for generations that you love? Or maybe something you have that you want handed down? Let me know! I love knowing your stories! Hey yall! Just a little life update-blog style! At the moment, were spending time in Greenville with family and its just what the doctor ordered.(Literally. I work for a doctor and he told me to enjoy time with my family this week. Boom. I actually can follow directions.) Sometimes being with the fam is just what we need right? And while family being in town is BEYOND fun, it’s slightly exhausting. We party hard yall! Ok by “party hard”, I might mean eating every piece of junk around and playing cards til the wee hours of the night. And let me tell you-these peeps don’t play around. We stay up until 2, 3, 4am+, and while it’s all fun and games when we are at it–the next morning is ROUGH. This poor mama can’t hang that late! I am a SLEEPER. I seriously love my sleep and NEED it. (Lame I know.) Kudos to all you people who can roll with the big dogs and stay up past midnight every night. I’m way jealous. Catch this: At one point this weekend, we had almost 30 people at our house. 30 PEOPLE!And you know what? It was one of the most fun family nights I can recall! I wish I would have taken some pictures to share with you–but I am a firm believer in the “if I didn’t take pics that night, it must have been a great time” mantra. Well, this was one of those nights. Definitely one for the books. So you will just have to take my word for it, K? And while I wanted to get my kids to sleep at a decent hour, everyone begged to let Ford stay up with the other kids. Sheesh. Any other Mama’s out there let the guilt get to them? Well I gave in and let him stay up past midnight. (He is usually in bed by 8pm.) So what does this mean for Mom? Let’s just say a “not-so-easy-day.And keep in mind, they have stayed up so late for several nights in a row now and ooooooh it kills me! I am a creature of routine when it comes to my kids bedtimes, because I know how they work. It’s so important for mine to stick to the plan or everything at some point will fall to pieces. Nonetheless, I am trying to sway a little bit for this week so we can enjoy family and I hope those little boys appreciate it! Either way, sometimes amidst all the craziness (and crabbiness) you need a new toy or puzzle or SOMETHING to keep the kids happy. Some highlights from our newest lady? The softness is out of this world. (Pardon the pun.) No joke– I can’t think of any softer fabric! She also has extra long arms and legs for giving the biggest hugs! On the website, they come in a variety of colors, designs, and different animals-all equally fun and sweet! Another plus, and in my opinion, maybe one of the greatest bits about these sweet creatures? They are wonderful for children with autism or anxiety disorders! Check out this fabulous article written HERE for some in depth information. Now my boys are 3 and 5 and are ABSOLUTELY IN LOVE with this lovie. They have a couple of things that have to go with us on every trip including Ford’s baby blanket (I made it when he was 6 months old) and Cash’s pillow.I have a strong feeling baby Kiri is the newest family member and will now be making every trip with us…I wish she was around when they were smaller! She is currently sleeping with my boys and it’s the cutest thing I have ever seen. For real real. Little Kiri has given us a little bit of peace this wild weekend and I felt like you all needed to know how awesome she has been to us! My kids have been walking around telling people, ” This is our first Blog-mail!” It’s the cutest thing ever, I’m tellin’ ya. Don’t you think these would make the GREATEST keepsake gifts for any kid you know? I also thought this would make one of those awesome animals you take a baby picture every month with-from newbie on up! It would be such a cute gauge to show how much they have grown each month, and every year after! They are bound to quickly turn into one of the kiddo’s best buddies! Fortunately, ihelpmoms.com is giving us a coupon code to buy one for everyone on your gift-giving list! Just enter code: ihelpmoms10 at checkout! Yall, check the website QUICK because so many CRAFT animals are on super clearance and will be finding new homes fast! Grab a few for the grand babies/nieces/nephews/EVERYONE. So if you feel like being the sweet parents for a minute, order one of these sweet babies for your little and thank me later. Ok so now that my rant about our newest love is over, how is your winter break? I personally am loving having Dale off of work for a WEEK STRAIGHT and seeing him have so much fun with his family in town. It’s the cutest! And getting to forego housework for a week is pretty killer too( Minus all the laundry that comes with 7 extra people sleeping here.) Other than that, we are living it up over here in Knoxville. What about you all? At any rate, thanks for checking in here I will see you guys next year! Hey dolls! Last blog post was a fun one, but this one has me equally giddy! I don’t know about you, but being tan is one of my favorite things about Summer. And by that I mean, slightly tinted so I don’t look my normal ghostly/transparent. But I think my body is programmed to rid myself of sad excuse for a “tan” the day Summer takes its leave. Lame. So I stay WHITE and it grosses me out on the daily. Cue Quicktan. So Quicktan is a MOBILE spray tan booth, if you will. They come to you-equipped with sprayer and tent and-and then they get down to business. I worked with Latasha, and let me tell you— the girl knows her stuff! She gave me the low-down on all things spray (Not to mention all the info she sent me before the tan). L was so sweet and made me feel comfortable from the second I met her! She even had to fight downtown parking in Knoxville (which happens to be a nightmare) and still came in smiling! That’s a win in my book. nd not orange or streaky in the least bit! These girls know what they are doing. Promise. I have been spray tanned so many times ( Ask my husband's family. They have seen me at too many family cabin weekends with orange streaks and drips down my ankles. I went to the wrong girls. I needed Quicktan. You need Quicktan! So this is my arm before my tan…..
an and after my first shower. hat, pictures don't do it justice–but my confidence level was THROUGH THE ROOF today. Not to mention all the people who commented on my makeup being perfect today. All because of the spray tan. The beautiful, beautiful spray tan. Ok one more–but this one with the dog. Sweet peach can’t help but be in the pictures too…and she showcases my tan pretty well if I do say so myself. I’m a little proud-can you tell???? So here you can see what you need to do before and after tanning. . Easy steps–just like any other spray tan. Except Quicktan is so different in every other way. They are sweet, personable, and professional. I have never seen a a spray tan so even in allllll my years of tanning. And I have tanned every way possible. Believe me. I’m telling you–the spray tan is the miracle fix. You want whiter teeth? Spray tan. Shinier diamonds? Spray tan. You want your eyes to look bluer? Spray tan. Want to cover stretch marks/scars? You guessed it. Spray tan. Look better in your skivies? Just want to feel better all around? Go check out Quicktan. It’s a huge mood/confidence booster–and that means you are happier all around, right? It’s certainly rung true for me-It’s a spray tan miracle! *****I have to say–I didn’t snag these benefits from Quicktan or some random internet site. These are all of the amazing perks I have witnessed on MYSELF. So rest assured, you will see them too! ***** Another great idea these girls have are spray tan parties! So if you and the girls are headed to the beach, why not all get tan before you pop that bikini on? Getting married and want your squad to keep your pics looking good? Why not all get a spray tan! Ladies–time to visit their site and book your tan. Don’t forget to use the code SMITTEN in the comments for $5.00 off! Tell them I sent you. We all are looking for it. No one can seem to find it-no matter what. Well, you know why-it’s not out there. As sad of a thought as that is, it’s true. There is no holy grail of skin care. There is no one-size fits all product. And if it did exist, it would be too expensive for any of us to afford. But every so often, you find something worth sharing-and I have a mask I can’t help but talk about! Some of my favorite Instagrammers use it and swear by it, but I have been beyond skeptical. No way is something this affordable going to work on MY crazy skin. Well, I can’t guarantee it will work for you, but I promise I will be truthful in what I feel about it! I bought the Aztec Clay Mask everyone is raving about on Instagram and Pinterest-and it did NOT DISAPPOINT . ( I tried to link if for you all, but ya know–technology isn’t always nice.) Here is what it looks like…. Now the packaging isn’t glitzy and it’s not anything fancy-but LAW does it WORK. My face was so soft after the first use! Whew! Made it past that-now back to the not-ugly stuff. -So it’s simple. Just mix with apple cider vinegar or water ( I used the Bragg’s ACV with the mother). Read the back of the pot for all the directions you need-you can’t mess it up! I am home making phone calls today and blogging, obviously, so why not get comfy while I’m here! OH! Did I mention it PULSATES???? Your skin feels like its moving around and tightening up. Weird/Oddly satisfying. Yall-check the back for all the ways to use it too! It’s not just a face mask–I won’t tell you all it does–I will leave that to you to see when you buy it ;). What’s your thoughts? Have you heard of this? Want to try it? Let me know! 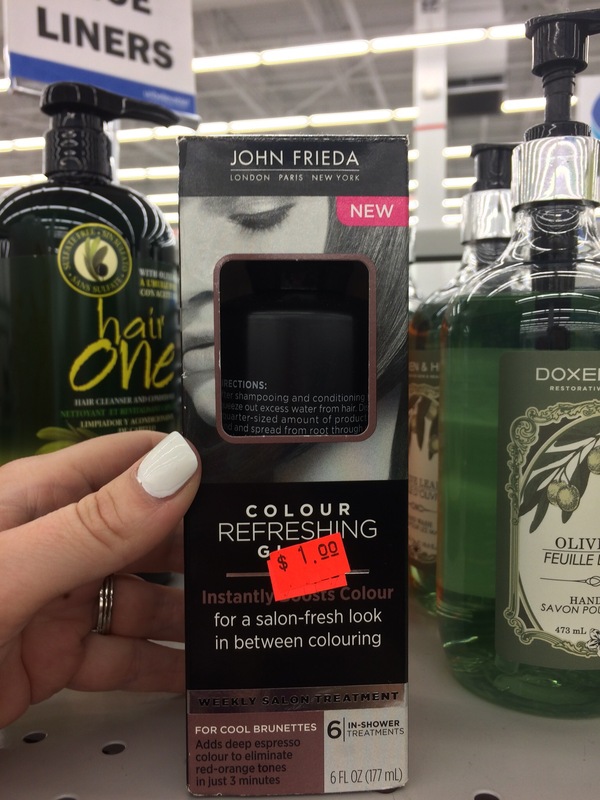 One of the best Dollar Tree Finds….And It’s a MUST HAVE. At any rate, I wanted to share one of my tried and true time savers–and this will work for anyone–especially those of us who hate to iron. 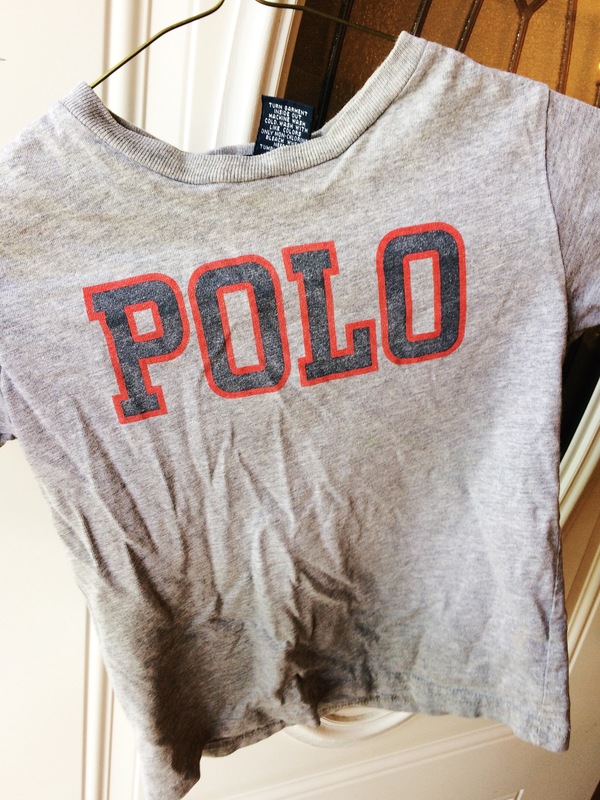 I am not going to lie, when my kids outgrow their clothes, I throw them in the bottom of the closet (sometimes they make it in the ” I’ve outgrown It box”, sometimes they don’t.) Nonetheless, they are wrinkled. To the max. Every one of them. Once again, Dollar Tree has come to the rescue. This wrinkle reducer y’all–all the praise hand emojis..Here. Let me throw one in here just for fun. 🙌🏻.. It’s bomb. Do the kids say that anymore? Someone fill me in. Notice what it looks like here…..
Now promptly leave your house, and go grab a bottle. It smells so fresh and clean–and it’s so simple to use! Evidently it is the off brand of Downy, which I didn’t realize existed. But I’m telling you, it can’t be much better than this. Just spray it on your wrinkled item, and give it a pull. Pull the clothing on each side, and then top and bottom. It’s awesome! Notice the difference in this shirt. Ok please don’t fault me as I forgot to spray the bottom of the shirt, ( I was so excited to share with ya people, per the usual) but isn’t the difference AMAZING????? SO MUCH EASIER than ironing. I also am a huge fan of the “throw it back in the dryer with a wet towel” trick, but sometimes there just isn’t time, ya know? Add in the nice scent boost with it, and you have a solid champ in this wrinkle releaser. The price point can’t be beat for the time it saves you! 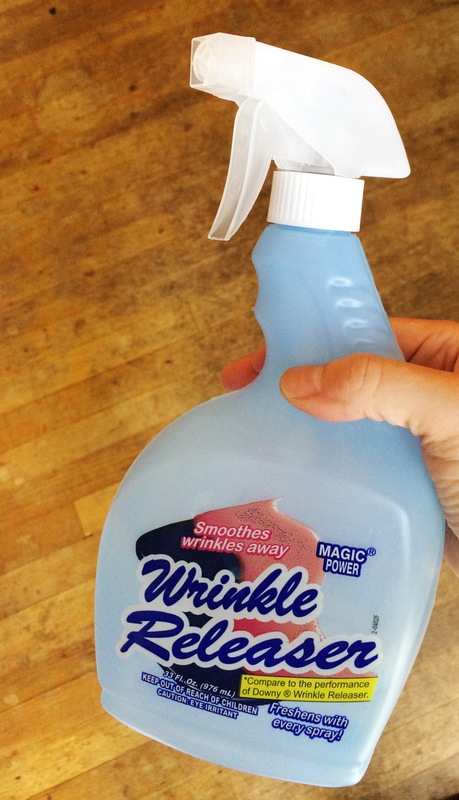 Do you use a spray on wrinkle releaser like this? What is your take on it?? Let me know in the comments!!!!! The greatest store for Deal shoppers…. I love me a deal. And I am a HUGE bargain shopper! Fun fact, when my husband and I were dating ,we were talking on the phone one night and he mentioned buying his dirt bike at a yard sale. I said, “You go to yard sales too?” This was the day I realized he was meant for me. No joke. I mean, on top of all the amazing things about him, now we could be thrifty together! Today, I wanted to share one of my ALL TIME FAVORITE stores with you….Drum roll please……its Gabe’s! Do you have a Gabe’s close to you? If not, you may want to google the closest one! I am not kidding ya’ll, it’s amazing. A friend introduced it to me and I have been hooked ever since! I stopped in today and wanted to share some of the deals I saw with my awesome blog followers-were in a club now! So you get in on all my good secrets from here on out! I tried to snap a few pictures as we were walking through the store, but two hungry munchkins were begging me to leave and I missed so much! But fear not, I will still fill you in on some of the goodies. If you aren’t familiar, Gabe’s is something like a big TJ Maxx/Marhsalls-but with better prices! 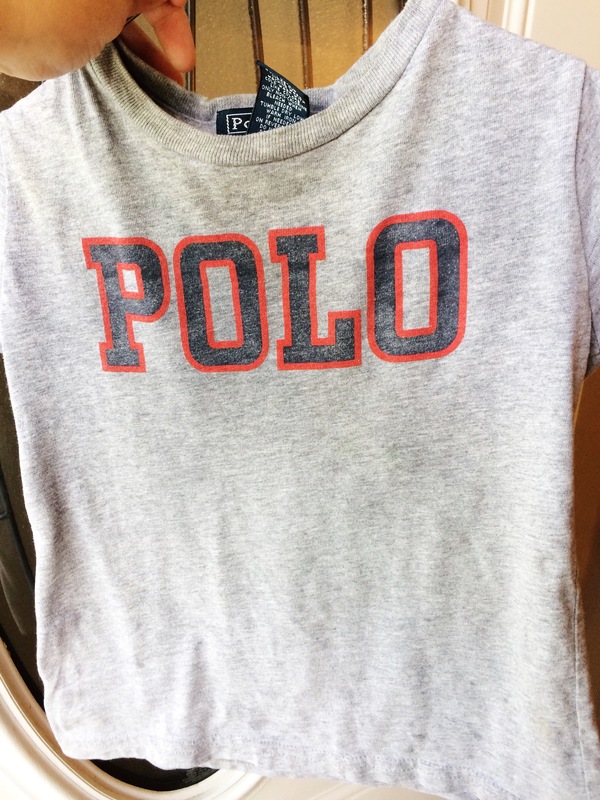 They carry AWESOME brands at a fraction of the price and it’s totally worth making a trip to the closest one. They carry clothes,jewelry, handbags, shoes, sleepwear, pet needs, toiletries, rugs, and countless other items! 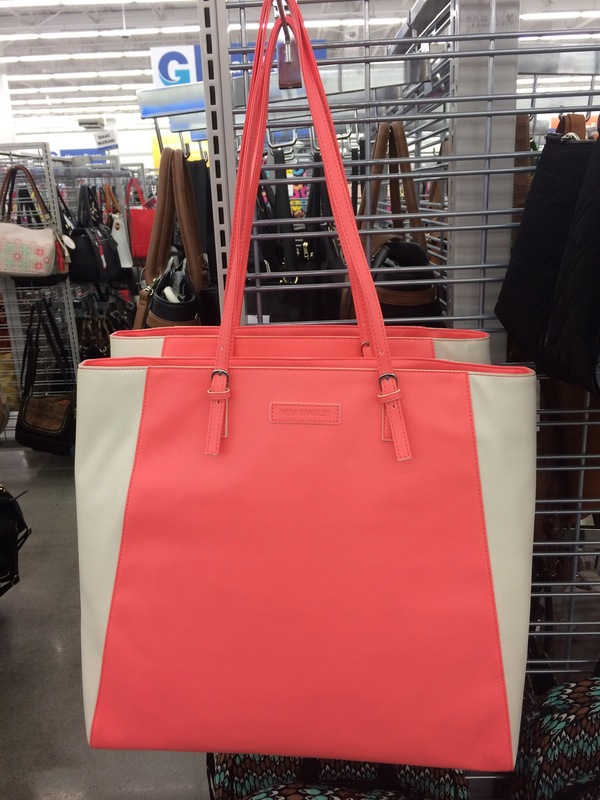 Most of the clothes I see are usually marked under $12.99, and purses are priced amazing! Prime Example: Vera Bradley. Check out these purses. DO you see that? 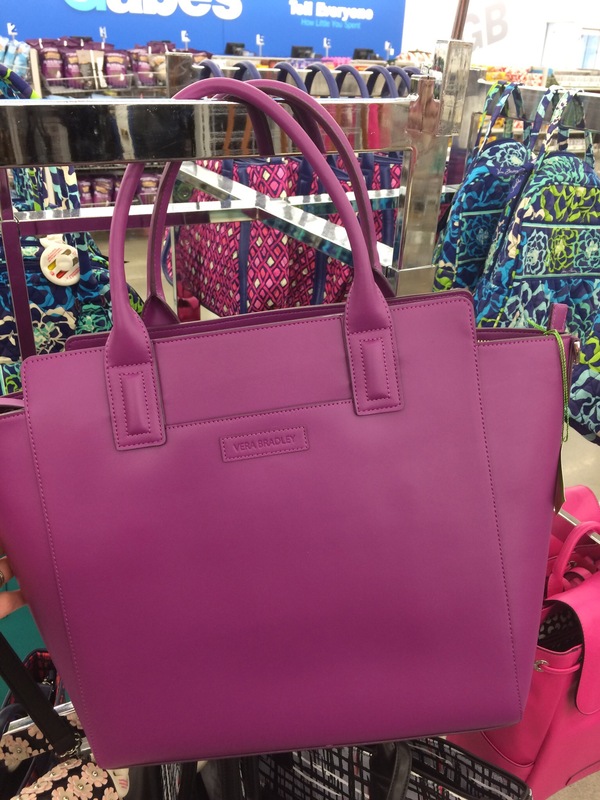 Every purse is Under $40.00-but the original price ranges for $98.00-$148.00! 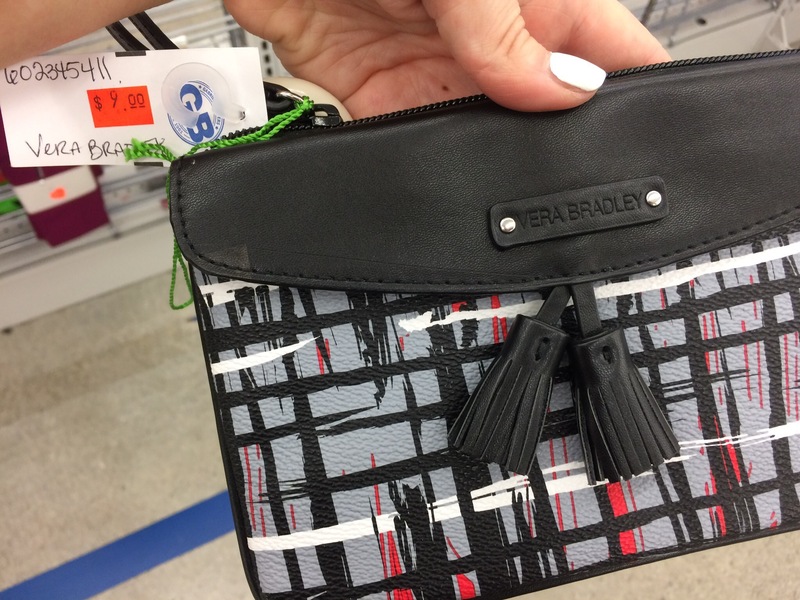 This wristlet was marked down to $9.00!!!! Awesome deal! 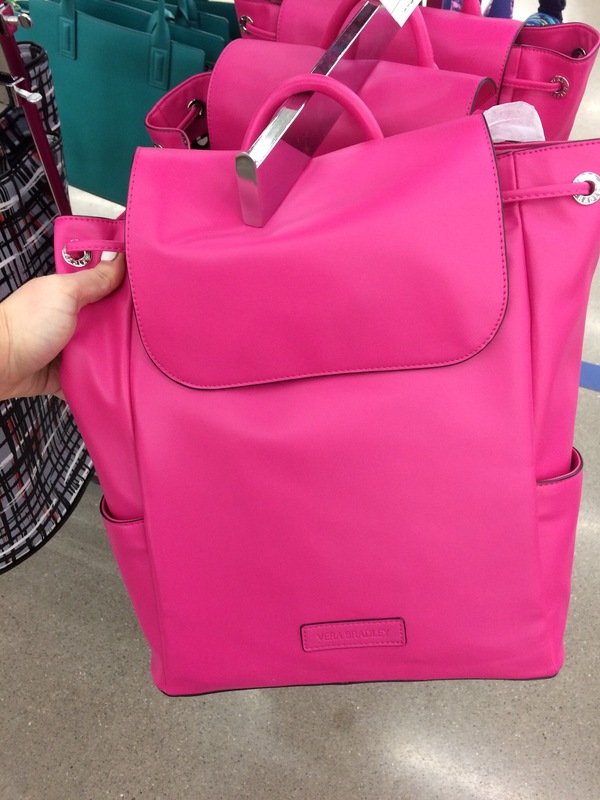 They carry Betsey Johnson and Anne Klein to name a couple others. Another great item for the men in our lives-Golf Shirts! 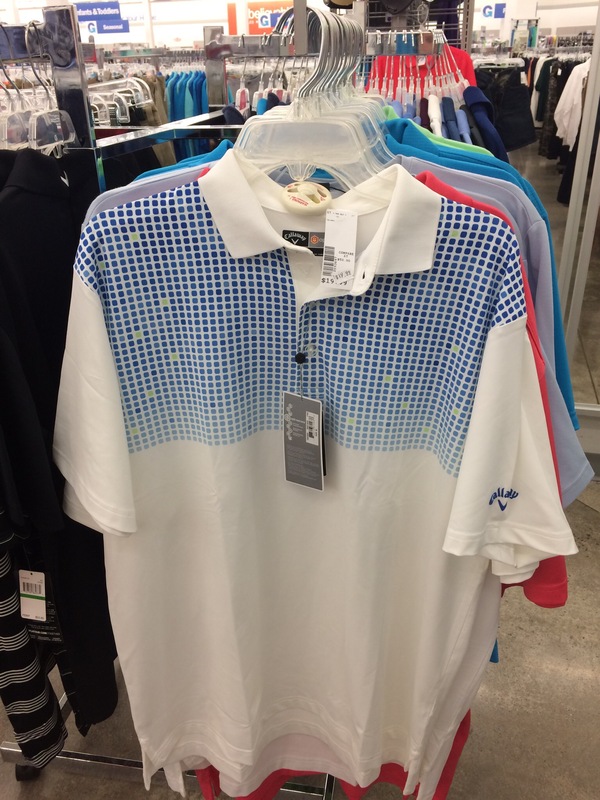 They carry some awesome Callaway golf shirts for under $20.00. That’s a huge price break from the $50.00-$70.00 shirts I usually see! They also had some really cute Adidas, Nike, and Under Armour shirts for guys, Great for gifts! They also carry Sperry’s for about $29.00 and sometimes clearance is cheaper than that! If you haven’t ever bought a pair of Sperry’s (boat shoes are my fav) then go out and buy them now! I have a few pairs and they last FOREVER. They are so comfy and Sperry’s stand behind their products! Go get some ASAP! I rate the company A++. Gabe’s also carries those uber cute Nike outfits for little boys for a fraction of what you would pay at a normal department store…Not to mention all the adorable Disney items! GO, go, go! Grab some now! Next, $1.00 shoes! Come on, now. 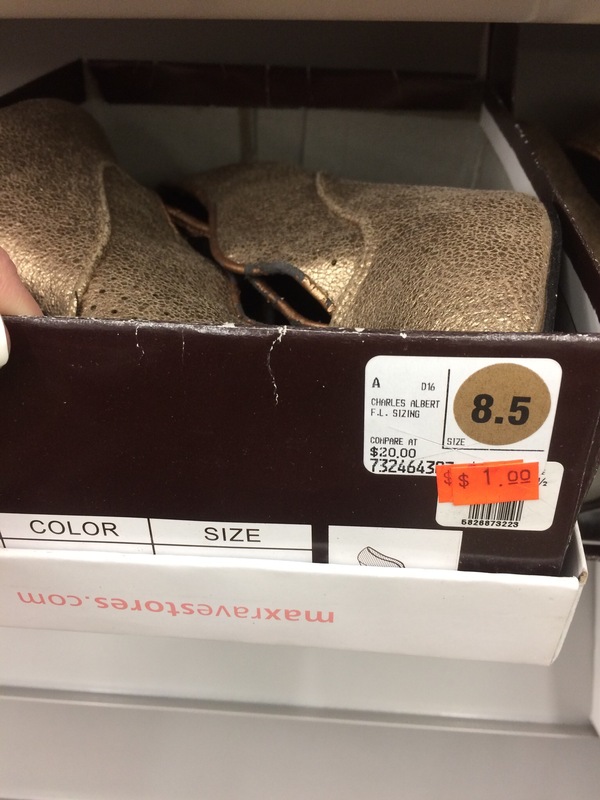 Shoes for $1.00?? Unreal! Now these were slightly beat up, but usually, the clearance isn’t damaged in the least bit! And clearance items are for the most part, $1.00, $3.00, $5.00 and $7.00. I can’t tell you the amount of items I have bought for $1.00-candles, makeup, soaps, toys, everything! So now you know some of my favorite buys at Gabe’s! They do markdowns every Monday, so its best to visit Monday afternoon if possible.
. Do you shop at Gabe’s? If so, what deals have you scored? ?